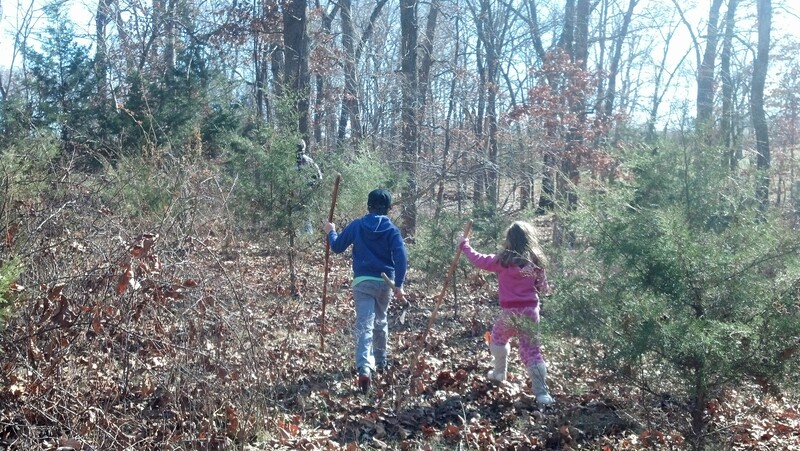 Sustainable Mom | Helping your family become sustainable! Helping your family become sustainable! Welcome to Sustainable Mom! My family and I moved from the city to a 25 acre farm. We are starting out slow, but plan on becoming as sustainable as possible. I have my parents to thank for the knowledge that I have. They have past down to me their gardening techniques, canning knowledge, sewing tips, crocheting, knitting, and the list goes on. I would like to pass that knowledge onto my children. Here you will find recipes, gardening tips, crafts, holiday ideas, and anything else that may come up. Thanks for stopping by, I hope you have found something that you can take back to your family, and come by and see us again! Growing up, we never had a real Christmas tree. Our tree was of the aluminum variety complete with a color wheel. I can’t complain too much. I actually loved looking at it at night watching the colors change from red to blue to yellow to green. 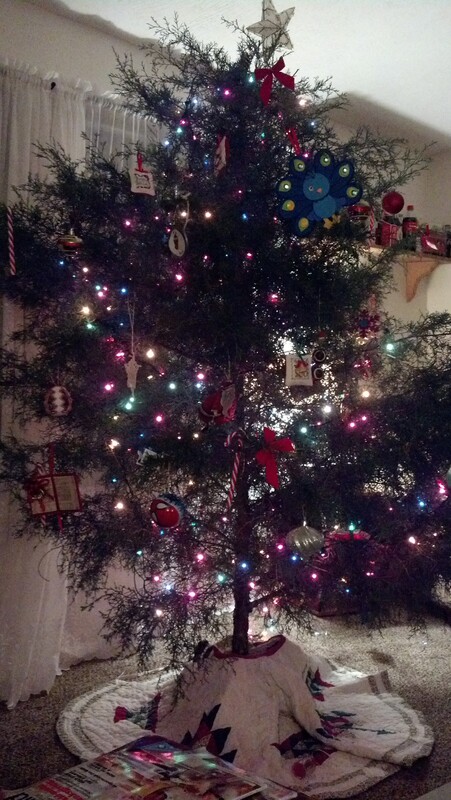 When I hit Jr. High, we put away the aluminum tree and bought a plastic green tree. I was so excited because it looked like a real tree! Ok… it was the same color as a real tree, but it still didn’t look like a real one. I kept asking my parents for a real tree, but it never happened. I had romanticized the idea of going out as a family into a winter wonderland and finding the perfect Christmas tree. This year my dream finally came true! 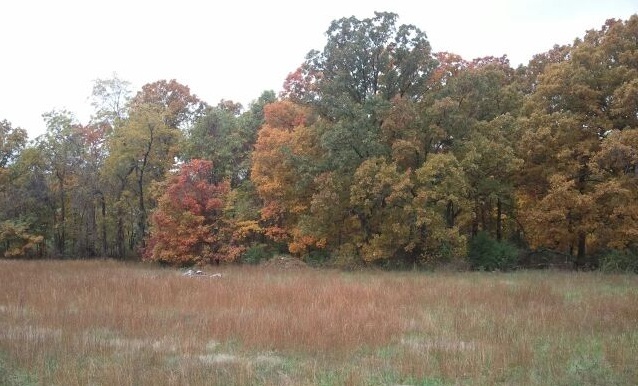 On our 25 acres, we decided to go out and find that perfect tree and cut it down. 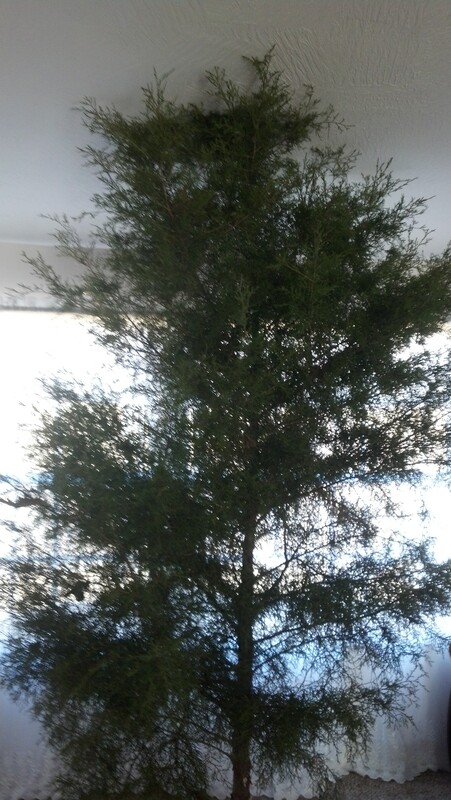 We have an over abundance of cedar trees that need to be thinned out, and while they are not your traditional Christmas tree, we decided that they would do nicely for our family’s purpose. On our way to find the perfect tree. We traveled around our place looking at different trees. Some were too big, some were too bare, and some were not the right shape. We finally found one that we thought would be perfect, plus it really needed to be cut down because it was being choked out by another tree. Daddy teaching Drew how to chop down a tree. 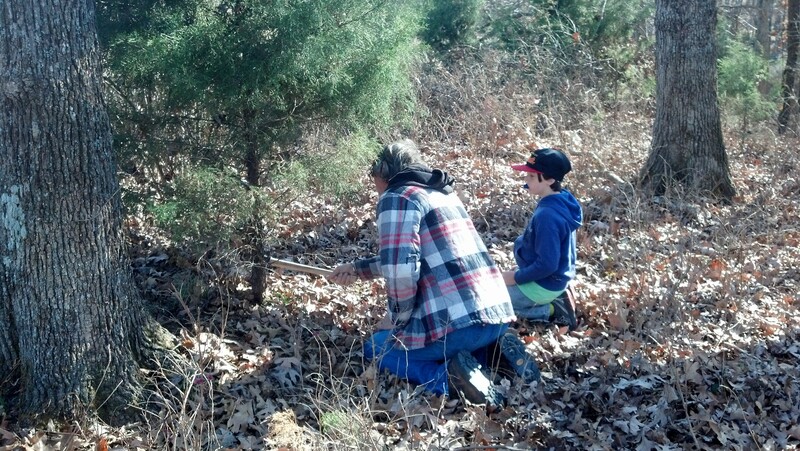 Using hatchets that my husband and son had hand forged themselves…will have a post on that later…they began cutting down our Christmas tree. I love watching my husband instruct our son on how to do things like this. It warms my heart knowing that we are teaching our kids life skills. 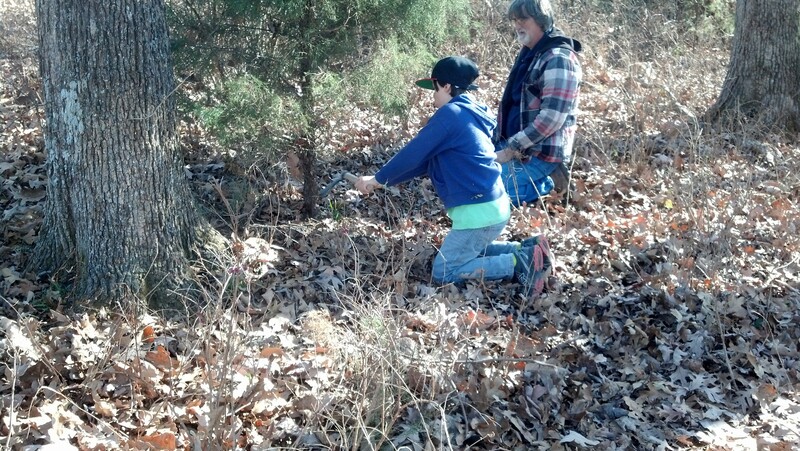 Drew’s turn chopping down the tree. After chopping down the tree, we returned to our house where my husband cleaned up some of the bottom limbs. We were so excited to get it into the house, however as you can see from the picture below we had a little more trimming to do. Too tall for our ceiling. So my husband took it back outside and worked his magic. Then he brought it back in and the kids and I (mainly the kids), worked our magic. I love how it turned out. As you can see several ornaments are homemade. It seems like the kids make some every year in school and I love having them on the tree. I even have some ornaments on the tree that I made when I was their age. The other thing we do is make sure the kids get one new ornament a year. That way when they grow up and are on their own, they will already have a box full of ornaments to decorate their own Christmas tree. What do you do for a Christmas tree? I have always wanted to have chickens. 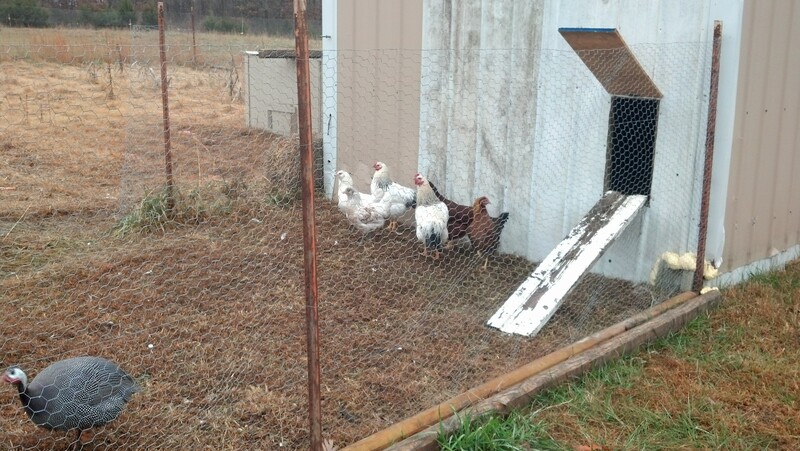 For the past two years, my husband has been promising me chickens, but because of time constraints on building a chicken coop, we never were able to get them. We talked about buying a coop, but that was just too expensive, and well not very sustainable. This summer I decided enough was enough! I was bound and determined to get chickens. So I pressed the issue. What really swayed my husband to go ahead and get them was the fact that they would be very helpful at pest control. We had major issues with pests in our garden this year. We lost our zucchini, squash, and pumpkins to squash bugs, and we almost lost our tomatoes to the Colorado potato beetle. 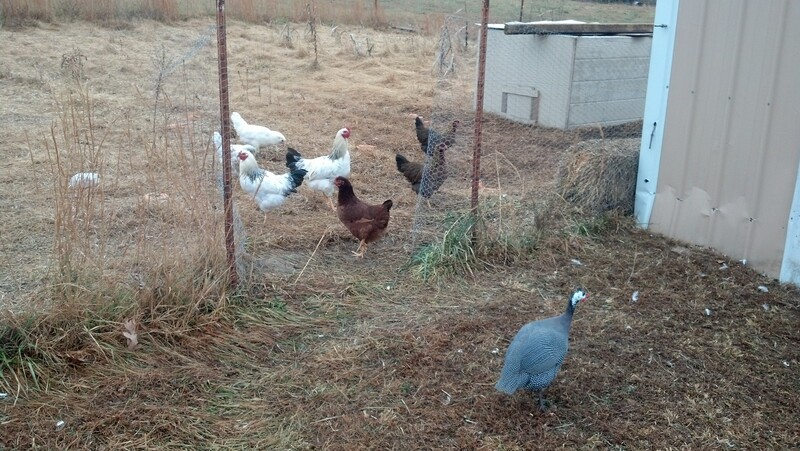 At the end of August we purchased 8 pullets and were told that they would start laying in a couple of months. We also purchased 4 guineas. We already have our garden, a 40′ x 60′ plot fenced off, so we knew we could let them loose in there and hopefully they would feast on all the bugs. All we needed was a coop. Our chickens enjoying our garden. After bringing our chickens home, One of them did not make it. But the rest seem to be pretty healthy. We ended up with two Light Brahma’s, one hen and one rooster; two New Hampshire; one Rhode Island Red; and two Easter Eggers. By our homemade chicken coop. In the picture above, you can see a part of the chicken coop that my husband built. It cost us $0 to build this coop because all the materials we used we already had. While it is definitely not the prettiest coop, I am so proud to say that it didn’t cost us one cent to build. I will go into detail in another post how our coop was built. Besides getting chickens for pest control, we of course were looking forward to the eggs. We had been getting eggs from our neighbor as well as a family member, but we wanted eggs from our own chickens. The end of October came and went and no eggs. Then November came and went. Still no eggs. We thought we were doing something wrong. We started talking to people we knew who had chickens and we found out we were doing everything that they were doing. Still it was a little frustrating. Well yesterday morning I went out to let the chickens out as well as water them and to my surprise there were two eggs in one of the roosting boxes! I was so excited. I guess we just needed to be patient a little bit longer as well as trust that nature would take its course. 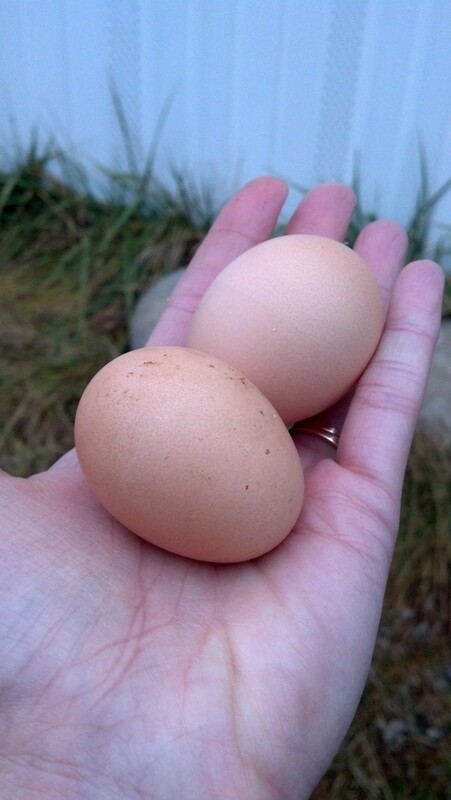 I have to say that for the first eggs, they are a pretty good size. We haven’t eaten them yet, but omelets are on the menu for supper tonight. While this may not be exciting to some, it is one step closer to our goal of being as self-sufficient and sustainable as possible. Growing up my parents always had apple trees. In the fall, I loved helping pick the apples knowing that they would turn into stewed apples, yummy pies, and applesauce. In fact my favorite breakfast meal growing up would be to eat homemade applesauce (preferably warm) spooned over toasted homemade bread. Yum, yum! While we do have apple trees on our land, ones we planted, they are not bearing yet. The trees are still young, and I am anticipating the day that I can pick apples from my own little orchard. However I did not let that stop me from going to a local orchard to get some apples for applesauce. There is just something about homemade applesauce that can’t touch the store bought variety! I am sorry to say that I do not remember the variety of apple that I bought. They were yellow, huge and sweet. They were rated as good eating as well as good cookers. My husband was an absolute sweetheart and peeled and sliced a half bushel for me. 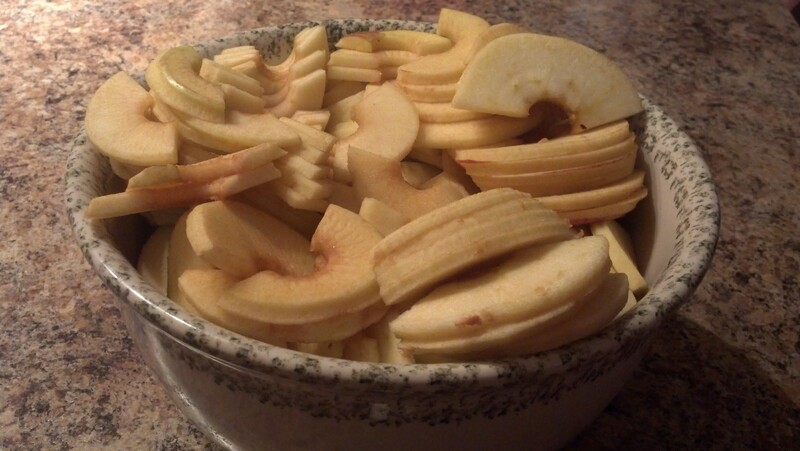 This is just one of the many bowls of apples that we ended up with. After the peeling and slicing, I cooked them down on the stove. Normally my mom would add water to them, but I decided that instead of adding a little water, I would add a little apple cider instead. This just helps them to cook down and not burn. I want to mention that the apple cider that I used was all natural with no sugar added. You don’t need a lot of liquid because once they do start cooking, they make their own. Here is a picture of what they look like after cooking for an hour on low. I like my applesauce a little chunky so I left it like this. If you like smooth applesauce you can always use a blender or if you have an immersion blender that would be the easy route to go. The only other thing that I added to our applesauce was cinnamon, but that is just our personal preference, you don’t even need to add that. NOTE: If you plan on canning your applesauce, you will need to add lemon juice for acidity to help preserve it. I did add lemon juice because I wanted to can my bounty. 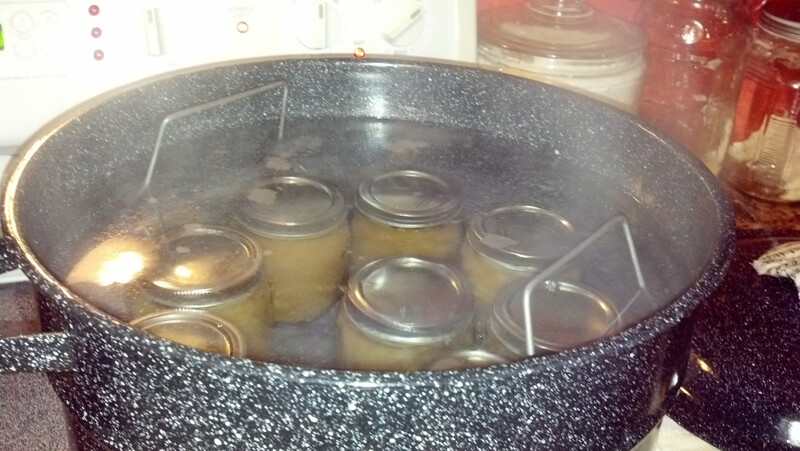 Here are my cans of applesauce getting ready to process in a water bath canner. They do need to process for 20 minutes. Start timing when the water comes to a full boil. I ended up with 15 pints of applesauce to enjoy throughout the winter! These would also make great gifts to give to friends this holiday season. 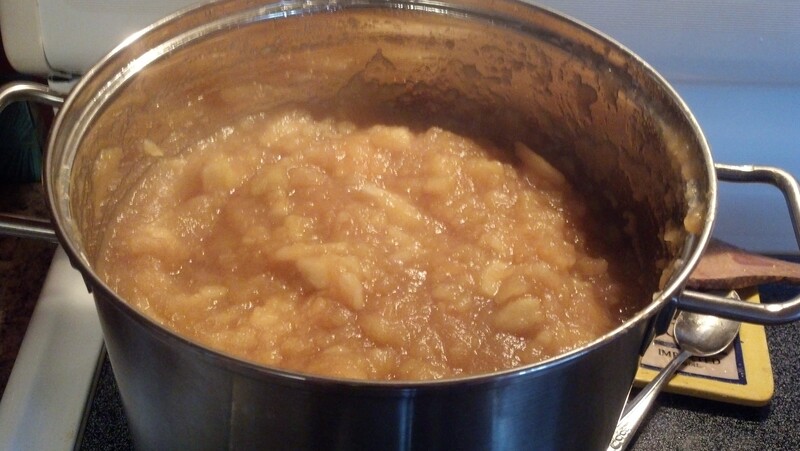 I hope that you are able to enjoy some homemade applesauce this season. I hadn’t planned on doing a post about grocery shopping but I got into a conversation about this topic with some others. Each one had their own take on how to do grocery shopping and while I believe that there is not one right way to do it, some were pushing the shop once a month method to the point it was making others feel like their own method was inferior. I have tried the once a month shopping method after hearing the many benefits it would have to my families budget, as well as all the time I would save only having to go to the grocery store once during the month, etc. However it never worked for us. I would always forget to get something which meant I would have to wait until next month to purchase it, because my budget for food would be gone. Also there are times where my family would want something for dinner that we just didn’t have. It would have to be put into the meal rotation for the following month. We would also miss out on some great sales at the store because, once again, our food budget would be spent for the month. For me shopping once a month had too many cons and not enough pros for my family. I have also tried shopping twice a month, but still that just didn’t work for us for some of the same reasons as stated above. While I really wanted to be that once a month kind of shopper, I decided to do what was best for our family and our lifestyle. We stick to our budget. We spend $60.00 a week on food and household necessities (like dish soap, etc.) and once the money is spent for that week, it is spent – usually in one trip. I only have to meal plan for a week at a time. If we are running low on a pantry staple, we won’t have to wait long till the next shopping trip to purchase it. If there is a special dinner my family wants, I can put it into next week’s meals/shopping trip. I can take advantage of the grocery sales each week. I have three grocery stores that I normally use. One is a chain, the other two are locally owned. I use these stores because I can get great deals on the food that I purchase. 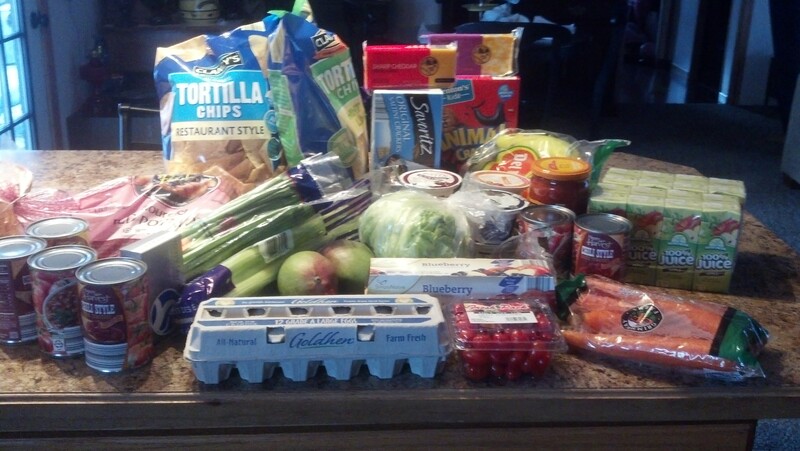 The above picture is about $30.00 worth of groceries from the chain store and if you notice there is quite a bit of produce included in this trip. I know most people plan their meals and then go shopping. While I do that at times, I stick to the sales so I can get the most bang for my buck and then plan my meals around what I have. While this method doesn’t work for everyone, not everyone can do the once a month shopping trip. The best thing to do is figure out what works best for your family and go from there. How do you all do your grocery shopping? For the past several days I have been tempted with a few days of warm weather and thoughts of getting in my garden to start this year’s planting. Saturday was gorgeous with sunshine and a high in the upper sixties. Sunday however saw temperatures drop and a snow storm that left us with around 3-4 of inches of snow. 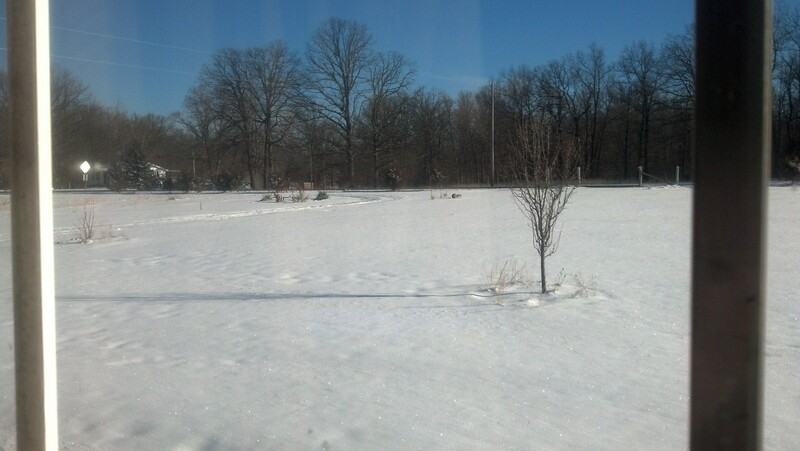 Today however the sun is out and the snow it already melting! This week should be lovely which is great since this is spring break. I already have plans for cleaning up outside and in. I have my seed onions and potatoes and I am ready to plant! That is if the soil dries out enough. One thing that I am behind on is starting my seeds…I should have planted them weeks ago! But what I found out is that it is okay, I try not to stress out if I don’t stay on schedule, so long as I get it done. I am using today to start my tomato seeds. I am using toilet paper rolls as my seed starters. It is the first time I have done this, so I will have to let you know how it turns out. As the gardening process keeps going, I will keep you updated. My goal is to grow enough for my family to eat on, but also to can and freeze so we can enjoy them throughout the winter. 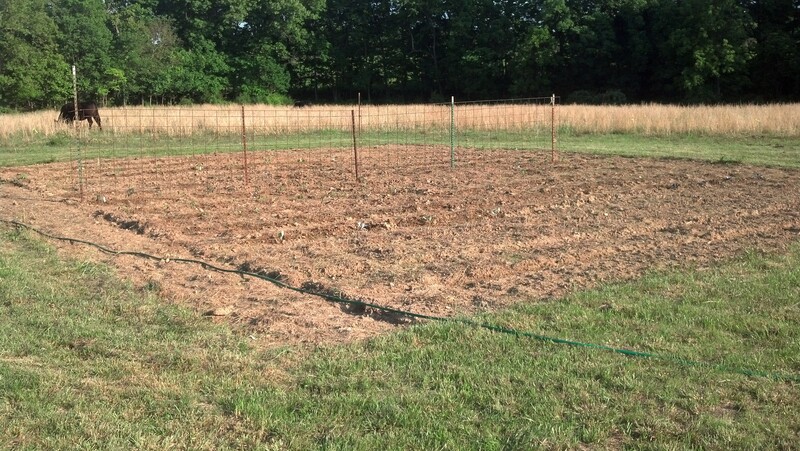 It is something that not only makes me feel accomplished, but it helps our family with our food bill, and teaches my children how to grow their own food. Something I want them to be able to do with their children.